interval training | Run Inspired. To sum up the Little method, it’s basically a warm up of 3-5 minutes followed by one minute all out at max effort and then 75 seconds easy effort. These intervals should be repeated 12 times, for a total of 27 minutes. The Turbulence method is a combination of weights and cardio. It includes a 5 minute warm up followed by an 8 rep set of weight lifting and then one minute of cardio (mountain climbers, jump rope, burpees, etc.). This should be repeated through a full body routine for a 45 minute workout. I bet you’d be pretty sore after that one. This sounds like a good Wednesday workout (that’s my do something different day). I love intervals. They are the only reason I’ve ever been somewhat fast at running. And due to my injury rate, I’ve become the master of intervals on an elliptical and spinning bike. I even broke an elliptical once going a little too fast 🙂 Opps! For the past two weeks my fabulous friend Emily has been meeting me Tuesday mornings for speed workouts. Last week we were on the track, but today it was locked so we made the most out of a long straight road on NC State’s campus. My planned workout was to to do 8 X 600 with 200 meters recovery in preparation for a 5K this weekend. Well after a 7.4 mile run in 85% humidity followed by a one hour high intensity interval class at HEAT studios yesterday, 600 meters seemed like 2 miles and the leg turnover just wasn’t there. During last week’s workout, I could maintain around a 5:45 pace and it felt tolerable and not too difficult. This morning? Yeah, different story completely. Although the distance was a little longer and there were some slight inclines, I was happy to do an interval sub 6:00. And the 600 meters were more like 400 meters. But thanks to my new workout music (here is my other new song), I was determined to find my limit. Six repeats in, and I think I came close to finding it. Although I didn’t actually puke (maybe because I hadn’t eaten since last night), I was having some serious gag reflexes. It was the closest I had ever come to getting sick from exerting so much effort, and I felt like I earned a badge of honor. (Yes, I got sick in Boston, but that was due more to hydration issues and the heat). I couldn’t wait to tell Emily. She gave me a high five. Why do people get sick when working out really hard? Personally, I didn’t feel like I belonged in any of these four categories so I kept looking. This article, which describes contestants on The Biggest Loser puking while working out, sums up how I felt today: “you’re overexerting yourself for your current level of fitness.” Yep. That sounds about right. It goes on to explain that as your muscles start to demand more oxygen, blood supply is diverted from its normal route and towards the muscles in need of oxygen. As a result, there is less blood flow to other organs such as the kidneys, liver, stomach, and intestines. This can make you nauseous or even make you puke. I guess there wasn’t enough blood getting to my digestive system this morning. I’m sure some people say I’m crazy for thinking this is a good thing. However, I’ve been really motivated lately, especially in watching the Olympic Trials. You may say pushing yourself so hard is a bad thing, but I say it’s how I come closer to finding my limits. 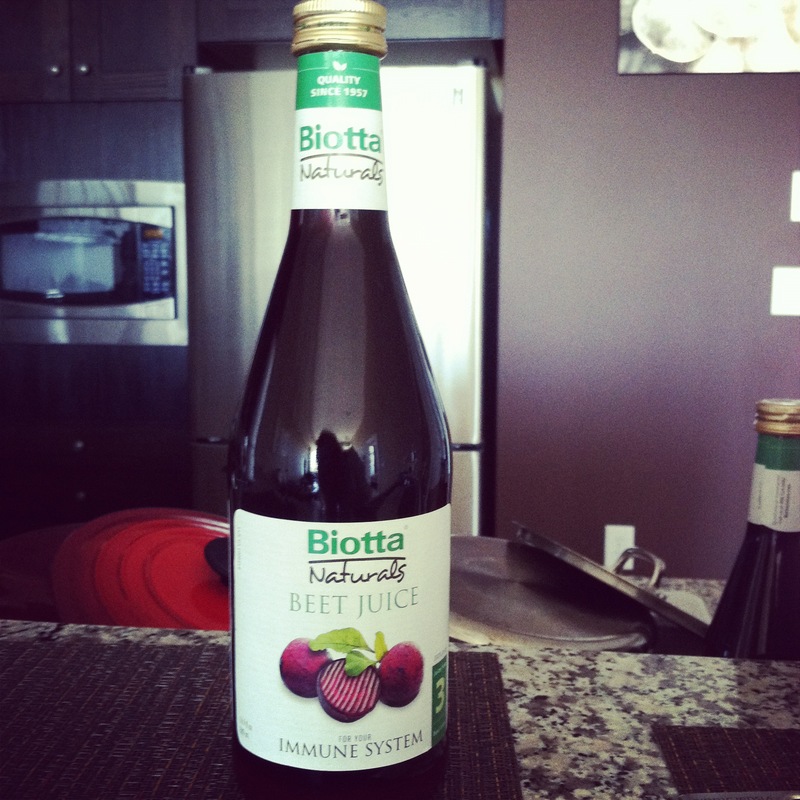 Yay for Earth Fare having beet juice!! What is my RHR? My max HR? And what are my training zones? To determine RHR, it is best to do it first thing in the morning before getting out of bed. Ideally, I would strap the HRM across my chest and take the lowest pulse as my RHR. However, I didn’t do that first thing this morning, so I’m doing it right now. I relaxed for a while before beginning to write this with my HRM and Garmin. The lowest recorded pulse was 53 beats / minute. It might read a little lower in the morning, but I think this is a good guesstimate. To determine MHR, I found a couple of formulas. The most common and simple one is to subtract your age from 220, but of course this is very general. To really find out your MHR, it is recommended finding a hill of about 200 – 300 meters and sprinting the hill, then jogging back down. Repeat this a few times and your highest recorded pulse is your MHR. All of the different formulas I found, put my MHR at around 190 beats / minute. During training, whether it be for a marathon, 5K, or a triathlon, each workout has its purpose. Perhaps it is for speed, recovery, or endurance. To achieve this, your heart is obviously working in different zones. If you are doing an easy run, there is no need for you to be training close to your MHR. There are five different heart rate zones (1-5). 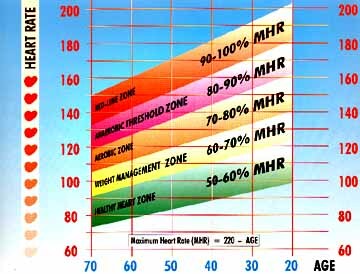 Zone one is 50-60% of your MHR and you should feel comfortable and be able to have a conversation in this zone. Zone two is 60-70% of your MHR and you will be breathing a little heavier, but still carry on a conversation. Zone three is 70-80% of your MHR and you will be breathing harder while actually increasing the number and size of your blood vessels. Zone 4 is 80-90% of your MHR and this is where you go hard. And at the same time, you get faster and fitter. Finally, Zone 5 is 90-100% MHR and this is when you go all out. This zone is mainly used for interval sessions and it is the zone that is probably the most uncomfortable / painful. (But it makes you faster!). This website has a great chart describing how long a workout should be for each zone and even breaks down interval and recovery sessions. I think using a heart rate monitor can be a very valuable tool. It can tell you if you are working too hard, too easy, and if you are over training. Raleigh, NC is quickly warming up and I know my times will slow down. Instead of focusing on the pace per mile, I plan to start using heart rate zones as a way to monitor my efforts. Maybe it will help to keep me off the injured list a little longer too. This past Friday I decided since Friday workouts are pretty short, I would do a tabata workout. Up until Wednesday, I had never heard of this type of workout, but thanks to my friend Sara (who keeps up with the latest trends and blogs in the running world), I learned about tabata. Well, I also learned a very good lesson from my tabata attempt on Friday and a long run on Saturday – don’t ever do these back-to-back. Your will be sore and your long might not be as long as you were hoping. Last week I posted about my experience with intervals and how they helped me to achieve my half marathon and marathon PR. Yesterday I went to Barnes and Noble and read quite a bit about Emil Zatopek in The Lore of Running and now I am even further convinced of the power of interval training. Consider this: In 1952 Zatopek won the gold medal in the 5,000m, 10,000m, and the marathon, all within 8 days and all Olympic records. Oh, and to add to that, he had never run a marathon before in his life and it was a last minute decision to enter the event. His training method? Intervals. He introduced interval training to the running world and this method has become an integral part of every athlete’s training schedule – regardless of ability. For those who have no idea what I’m talking about, interval training alternates high intensity work periods with lower intensity rest and recovery periods. Interval workouts should only be done 2 times a week at most, and it is important to allow for adequate recovery between workouts (48 hours normally). You’ll be amazed at how quickly you start to see results. Too bad learning to run fast has to hurt so much, but I guess it’s all a question of how bad do you want it?